Soft, chewy and delicious. Decorate with original or create your own flavor of icing! I made these with Strawberry! Whatever you choose...you better grab one quick, because these cookies go fast! 1. In a medium bowl, whisk together flour, cornstarch, baking soda, baking powder and salt. Set aside. 2. In the large bowl or in the bowl of a stand mixer add butter and sour cream. Beat until creamy. Scraping down the sides when necessary. 3. Slowly add sugar and beat until well combined. 4. Add egg and egg yolk and vanilla. Beat until combined. 5. Add half of the flour to the wet mixture and beat on low speed scraping down the edges when necessary. Add remaining flour and mix until all flour is incorporated in the dough. 6. Cover the bowl with plastic wrap and let chill in fridge for 2 hours. 7. On a lightly floured surface, roll out half of the dough to 1/4 “ thick. Cut out the cookies and place on a parchment lined baking sheet. 8. Bake in oven for 6-7 minutes at 400 degrees. Remove and let cool completely before decorating. 1. 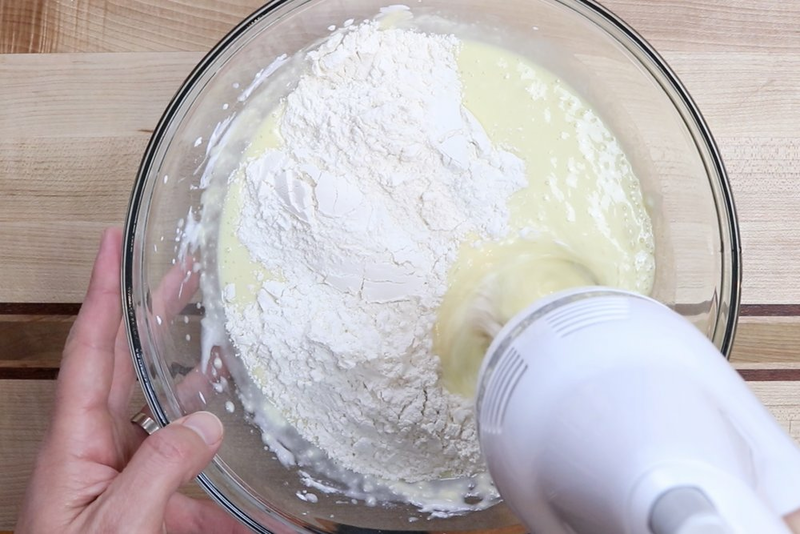 With a hand mixer or in the bowl of a stand mixer, add butter and beat until smooth and creamy. 3. While mixing on low, slowly add powdered sugar. Mixture will be clumpy. Add some of the heavy whipping cream and mix until smooth. 5. Gradually increase mixing speed to high and beat for 1-2 minutes and icing is light and fluffy. 2. Add the vanilla and salt. Mix until smooth. 4. Repeat last step until desired consistency is reached. In a medium bowl, whisk together flour, cornstarch, baking soda, baking powder and salt. Set aside. In the large bowl or in the bowl of a stand mixer add butter and sour cream. Beat until creamy. Scraping down the sides when necessary. Slowly add sugar and beat until well combined. Add egg and egg yolk and vanilla. Beat until combined. Add half of the flour to the wet mixture and beat on low speed scraping down the edges when necessary. Add remaining flour and mix until all flour is incorporated in the dough. Cover the bowl with plastic wrap and let chill in fridge for 2 hours. On a lightly floured surface, roll out half of the dough to 1/4 “ thick. Cut out the cookies and place on a parchment lined baking sheet. Bake in oven for 6-7 minutes at 400 degrees. Remove and let cool completely before decorating. 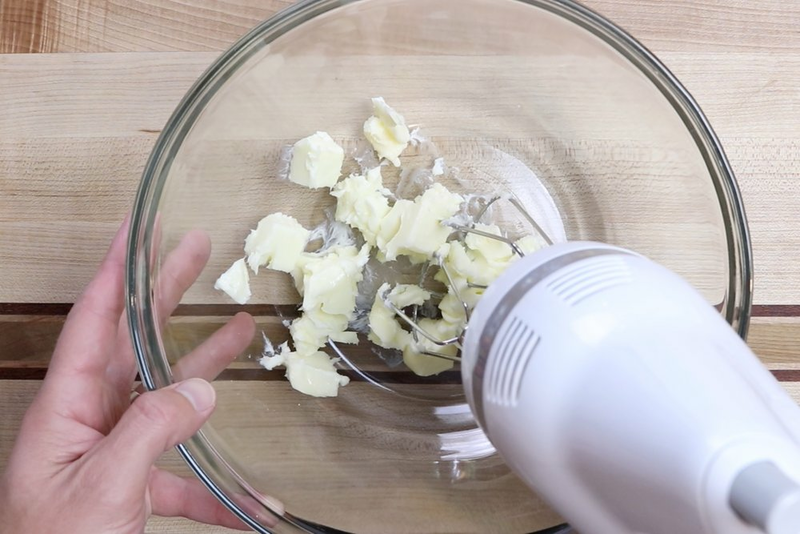 With a hand mixer or in the bowl of a stand mixer, add butter and beat until smooth and creamy. Add the vanilla and salt. Mix until smooth. While mixing on low, slowly add powdered sugar. Mixture will be clumpy. Add some of the heavy whipping cream and mix until smooth. Repeat last step until desired consistency is reached. To make the strawberry buttercream as shown in the picture. 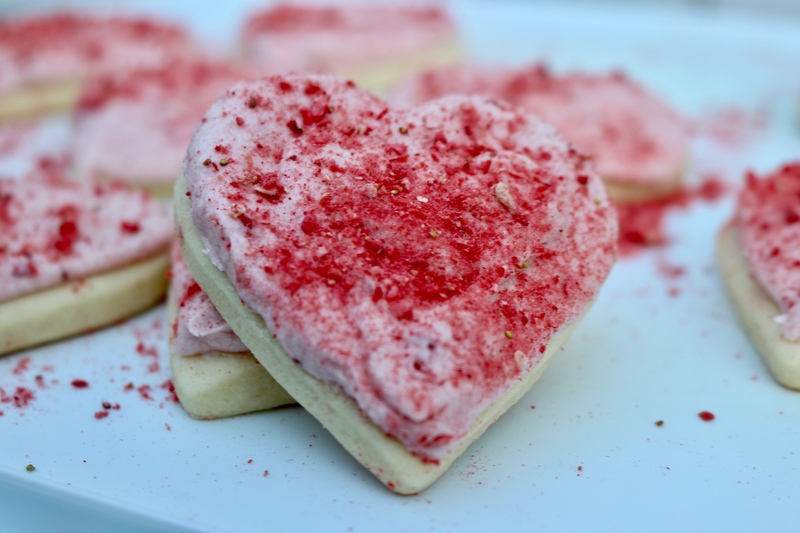 Just add 2 tablespoons of strawberry preserves to your buttercream and mix together well. I sprinkled the top with crushed freeze dried strawberries for extra flavor. You can also mix other preserves with the buttercream base to make different types of buttercream flavors. Get creative!